WHY AND WHEN DID BASEBALL PLAYERS start wearing golf gloves in the batter's box? Golfers, more than anyone else, might be the first to ask that question seeing, as they do, ball players tugging at their golf gloves as they approach the plate. said golf was his favorite sport. Some say it was Bobby Thomson of the Giants who wore a glove during spring training in 1949; others say it was Ted Williams in '53, when he came back to the Red Sox from Korea. Baseball historians also point out that Larry Doby, the first African-American player in the American league, wore a glove, but it seems that everyone agrees Ken Harrelson was the first baseball player to step into the batter's box during a game wearing a golf glove. One account says he first used the glove on September 4, 1964, when he was with Kansas City and playing against the Yankees. It seems Harrelson had played 36 holes that afternoon and arrived at the ballpark with a blister on his hand. He had not expected to play that night but found he was batting third in the lineup. According to Harrelson, in an article written by Scott Merkin, the Hawk remembered his golf glove was in his pants pocket, and he put it on to get some protection, then hit two homers that night against the Yankees. Thus, the batting glove was unofficially born. 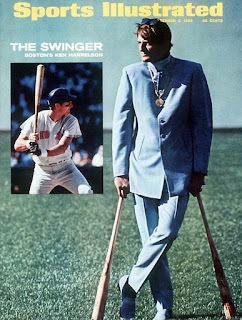 "From that day on, I never hit again without one," Harrelson said. Also according to Harrelson, the Yankees got back at him the next day. "Mickey Mantle,” recalled Harrelson, "had the clubhouse guy go buy a couple of dozen red All-Star golf gloves because that was the color I was wearing. They all ran out onto the field wearing red golf gloves, and that's how the hitting glove got started." Today Ken Harrelson is an announcer for White Sox games. It is his 31st season in the booth. Before the television gig, he played nine seasons with the Red Sox, Kansas City, Washington and Cleveland. his career ended in 1970 when he broke his leg. Harrelson always says that of the sports he played, golf was his favorite and his best game. He played golf professionally for three and a half years after his baseball career, qualifying for and playing in the 1972 British Open (missing the cut by one shot) and winning some small non-tour events, before turning to the broadcast booth, first with the Red Sox and then Chicago. I met him at the 1971 PGA Qualifying School, this former "rite of passage" for new players to the Tour, when I was researching and writing an instructional book based on the skills of young players. That year the "Hawk" was one of 357 golfers who had paid an entry fee of $300 and then attempted to qualify for the Tour at one of three regional tryouts (Winston-Salem, North Carolina; Quincy, Illinois and Riverside, California). Seventy-five players survived and attended the school at the PGA National Golf Club, Palm Beach Gardens, Florida. It was 108 holes of competition for those players and it was there that I met Harrelson as well as other young pros: Tom Watson, Lanny Wadkins, John Mahaffey, David Graham, all of whom had made the cut. This class of young professionals is considered the best ever to qualify for the PGA Tour. Harrelson had an opening round of par in the tournament, but withdrew after shooting 75 and an 82. He would try three times to qualify, but never made it. The photographer for my instructional book, Better Golf, published by Follett, happened to be Richard Raphael, who took the iconic photo of the Hawk in a Nehru jacket standing out in center field at Fenway Park. It appeared on the September 2, 1968 cover of Sports Illustrated. Harrelson often in the late sixties wore Nehru jackets, multi-colored bell-bottom slacks and white cowboy boots. At the time he was one of the most colorful players in the majors, as well as among baseball's best golfers. While he got his nickname "Hawk" from his famous nose when playing baseball, he also invented the "Hawk Walk" for the golf course. If he made a birdie, he would strut forward, arms stretched down, jaw jutting, to pluck his ball from the cup. Harrelson wasn't the only golfer to show baseball how to hit a ball. Also in Chicago, but across town at the Cubs' Wrigley Field, Sam Snead in 1951, showed the fans what a real golfer could do with a golf ball. Wrigley Field's 89-foot scoreboard deep in center was too far away from home plate and too high for any ball -- baseball or golf -- to clear the wall, even with a driver, or so thought the fans. Sam Snead, however, was invited to try and hit a golf ball out of the park. And he did. He drove a golf ball over the scoreboard, clearing it, not with a driver, but a 2-iron. Now, of course, players like Bubba and Rory would need only a wedge, and, of course, they'd be wearing a glove.